Alushta is rightfully considered one of the best resort cities in the Crimea. 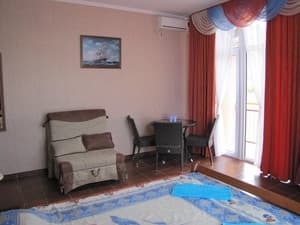 It is here in the most picturesque place of the city - the Professor's Corner is the villa "Annigora", located at the foot of Mount Kastel, 300 meters from the sea and 20 minutes walk to the water park. 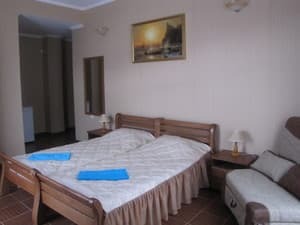 The villa offers accommodation in 21 rooms of "junior", "comfort + panoramic", "comfort +", "comfort" and "standard" style, equipped with air conditioning, LCD satellite TV, refrigerator, safe, bathroom, free Wi-Fi access. The rooms have balconies with a charming and unforgettable view of the sea, Mount Castel and vineyards. 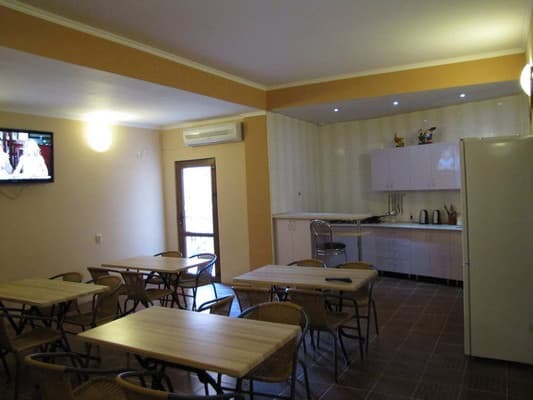 On the territory of the villa "Annigora", guests are provided with a kitchen for self-cooking, as well as free parking for 12 cars, a children's playground, a summer terrace with a fountain, a terrace, a brazier. PRICES CAN CHANGE, YOU NEED TO RECEIVE INFORMATION FROM THE OPERATOR! 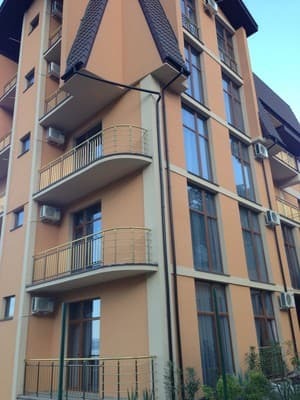 Description of the room: One room with a total area of ​​20-25 square meters, a French balcony / without a balcony (view: mountains / neighboring building). 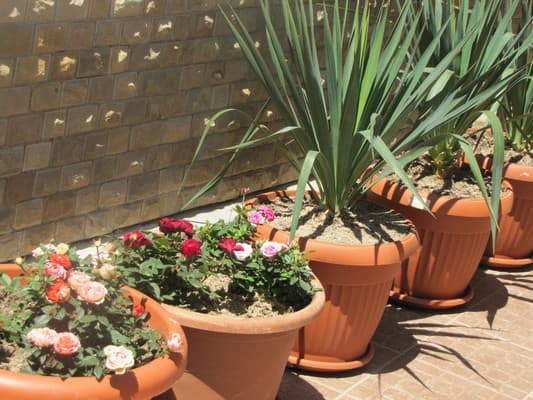 Rooms of this category are equipped with everything necessary for a comfortable stay. In the room there are 2 stationary beds, there is the possibility of placing extra beds. Hot and cold water is supplied around the clock. Description of the room: One room with panoramic windows and a balcony (view: mountains / neighboring building). Rooms in this category are decorated in a classic style. 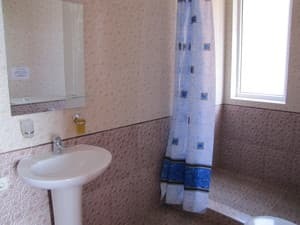 The total area of ​​the rooms is 20-25 sq.m. Rooms are equipped with everything necessary for a comfortable stay. In the room there are 2 stationary beds, there is the possibility of placing extra beds. Hot and cold water is supplied around the clock. Description of the room: One room with panoramic windows and one balcony (view: sea / mountain / vineyards). Rooms in this category are decorated in a classic style. The total area of ​​the room is 20-25 sq.m. Rooms are equipped with everything necessary for a comfortable stay. In the room there are 2 stationary beds, there is the possibility of placing extra beds. Hot and cold water is supplied around the clock. Description of the room: Two-room suite with a total area of ​​50 square meters. 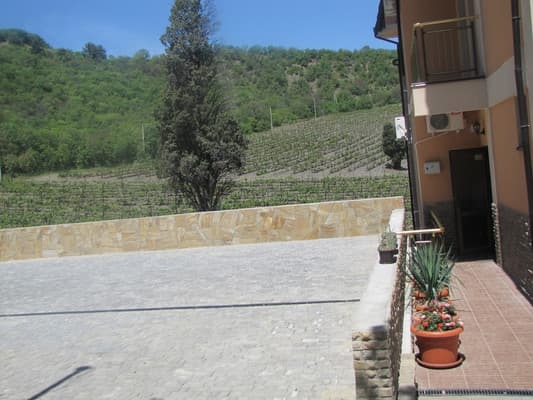 with panoramic windows, with one balcony (view: vineyards / sea), equipped with everything necessary for a comfortable stay. In the rooms there are 4 stationary beds, there is the possibility of placing extra beds. Hot and cold water is supplied around the clock. Description of the room: One room with panoramic windows and two balconies (view: sea / vineyards). The rooms are decorated in a classic style. The total area of ​​the room is 25-30 square meters. Rooms are equipped with everything necessary for a comfortable stay. In the room there are 2 stationary beds, there is the possibility of placing extra beds. Hot and cold water is supplied around the clock. 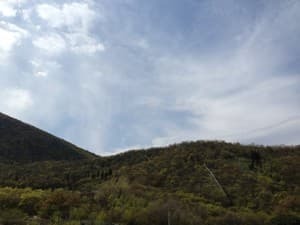 Чисто, аккуратно, очень тихо. Красивый вид, соответсвует обещанному. Незаметное и хорошее обслуживание. Для тех, кто не люибт лишнего шума - очень хорошо. Вайфай общественный не работал, но служащие просто давали свой рабочий нетбук при необходимости. Children under 6 years - free of charge without providing a place. The price of the additional place is 100 - 150 UAH. ul. Embankment 24 a ("Professor's Corner"), city of Alushta. From the bus station Simferopol to the final station "Professor's Corner" in Alushta by shuttle or trolleybus number 52.51 (48 km. ), Then to the recreation center "Otrada" by taxi or electric car (1 km).